Parrotfish play an increasingly important role in tropical reef ecosystems that suffer the depletion in reduction of coral cover. Parrotfish maintain coral reefs by consuming and removing macroalgae, which otherwise would cover the reef, causing it to become unhealthy and hindering it from growth. Removal of macroalgae allows the coral reef ecosystem to continue its natural process. The abundant consumption of algae by parrotfish directly affects the algal community by hindering its growth. Parrotfish are known for their excavating and scraping skills. Their teeth are tightly packed along their jaw line and they have a parrot-like beak. The distinct beak-like mouth is strong with a pointy tip that can gain access to hard-to-reach crevices of the coral reef. This unique feature and the ability to remove algae from the reef makes the parrotfish irreplaceable to the reef ecosystem. 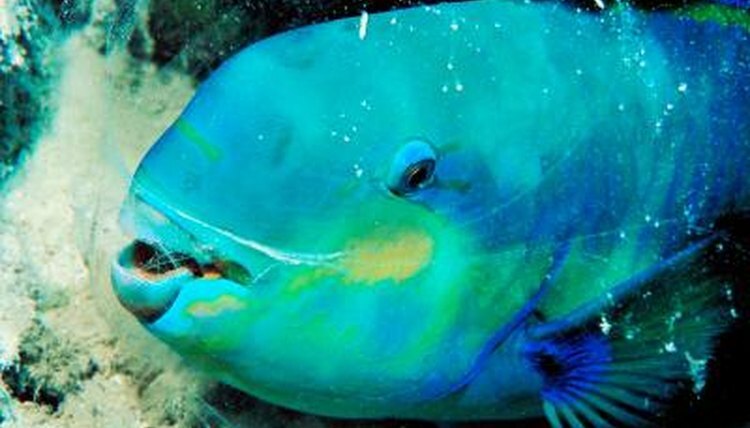 The Bolbometopon muricatum species of parrotfish, also known as the green humphead, is responsible for the distribution of coral sands in the reef biome. The green humphead parrotfish uses its pharyngeal teeth to grind up coralline algae, digest it, excrete it and distribute it into the reef biome. One green humphead parrotfish produces up to 200 pounds of sand per year. Parrotfish directly affect the coral size and density of the coral reef colonies. The abundance of grazing results in changes in composition and population size. Focused biting can have a negative impact on the reef due to constant, repeated overlapping bites that cause extensive damage and removal of large patches of coral tissue. While spot biting is beneficial to the reef ecosystem, the individual bites usually are distributed evenly across the entire skeleton of the reef, removing algae and not causing repeated scarring of the reef tissue. Parrotfish have the capability of feeding and changing the structure of coral reefs by providing the removal of algal turfs and coral tissue. The grazing of algae activity mainly focuses on the reef crust. Scraping is done near the short algal turfs, commonly causing scarring to the reef. Parrotfish directly affect the shaping nature of the reef as well as interaction among the reef habitats due to their grazing and scraping activity. At times, parrotfish will graze and seek out the area of the reef that provides the most nutritional benefits, causing the parrotfish to target coral areas with higher densities of macroboring organisms. Routine and repeated removal of algae in the same spot causes scarring to the reef and ultimately changes the structure shape by eliminating future growth in the scarred area.